Pressure cook tomatoes in 2 glass of water for 1 whistle. Let it cool. Take out the skin and blend it well with a blender. Strain it if necessary. Par boil peas and carrots. Take a pan. 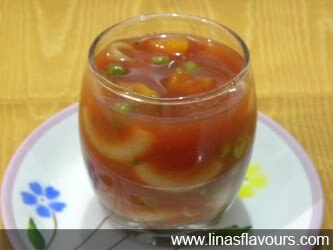 Add tomato puree, 2 glass of water, peas, carrot, pasta, salt, sugar, black pepper, oregano and let it simmer till pasta is done. Stir it occasionally. Add water if necessary. Serve it with any bread or rice.